Just before the full moon the fishing was great with lots of pink salmon with coho mixed in but with the big tides Wednesday the pink salmon moved on to Indian Arm. There was a few coho swimming around but the challenge was back on to get one of this fish to bite. You can really feel the absence of the pink salmon with a fewer bent rods. Early this week the low tides are going to be in the afternoon, which will make a little tougher fishing on the bright sunny days. From August 5 the low tides shift into the morning again so until then it if you can go first thing in the morning, anchor up in the bay with a floatation device of your choice. Guest Sam with a pink landed on a guided beach fishing trip with Andre. Last week the fishing was hot and cold and so was the weather. Overall the fishing was pretty good but last weekend and Monday’s cold days of rain were good news for river fishermen but not for coho fishing off West Vancouver. A lot of our cohos got past us and escaped up the river. Hopefully it’ll draw some bigger fish and the numbers should build up in the next little while. We’re now focusing on schools of pink salmon and a few chinook that have already arrived. When you do find a school of pinks and they are on the bite the action is non-stop! In amongst the pinks expect a few good hits on chinooks and cohos as well. Productive areas have been around the QA, Bell Buoy, T10 and Point Atkinson. The depths have been between 40′ to 80′ depending on the area. Dimitri’s guest with a well-earned chinook! As an example, Last Wednesday there was a simultaneous bite for Chinooks off Point Atkinson at 50′ t 80′ and at the Bell Buoy at 40′ to 60′. Anchovies are the primary lure but small pink hoochies are the ticket if its pinks you’re after. A Runny Nose and Spackle Back Anchovy teaser heads have been working best for me. 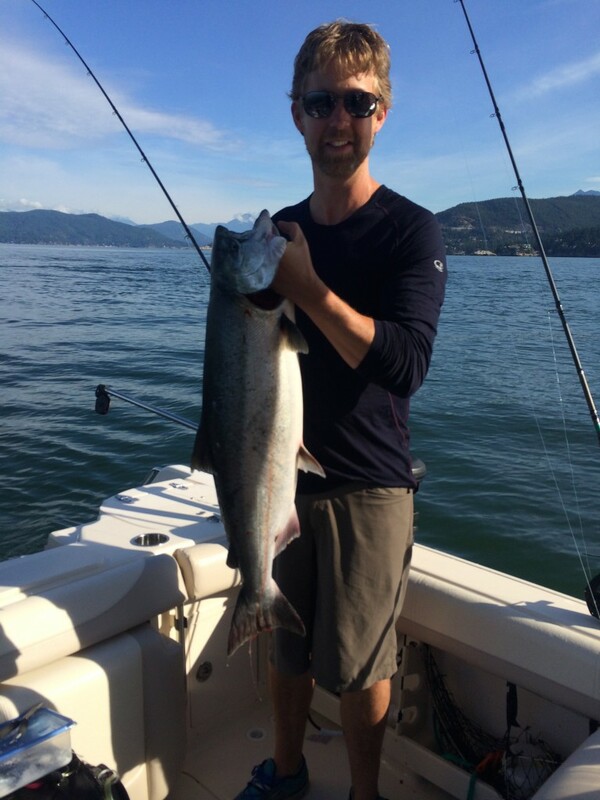 I should note last Tuesday one of our guides Todd hooked up a 20lb chinook on a pink hoochie. Unfortunately it got away but now it’s out there for someone else to battle! I had a trip in which we had our limit of pinks and I swapped out the pink hoochies for mini white hoochies and hooked a very nice big wild coho. I also found that the pinks liked the mini whites as well. 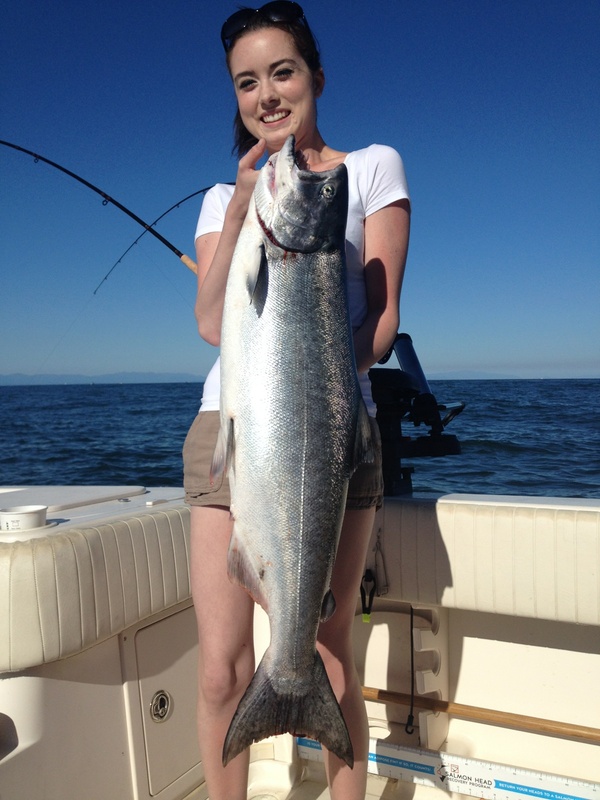 Haley with her first chinook! We’ve covered the various flashers in previous reports but my choices are Chartreuse glow, Green Onion and green betsy flashers. It looks like we have another spell of nice dry weather and the tides will only get better as we phase out of a full moon. I do expect the fishing to really start to heat up! Eddie + the PA Saltwater Team, Jason, Dimitri and Warren. New name, new date, new location – same great derby! 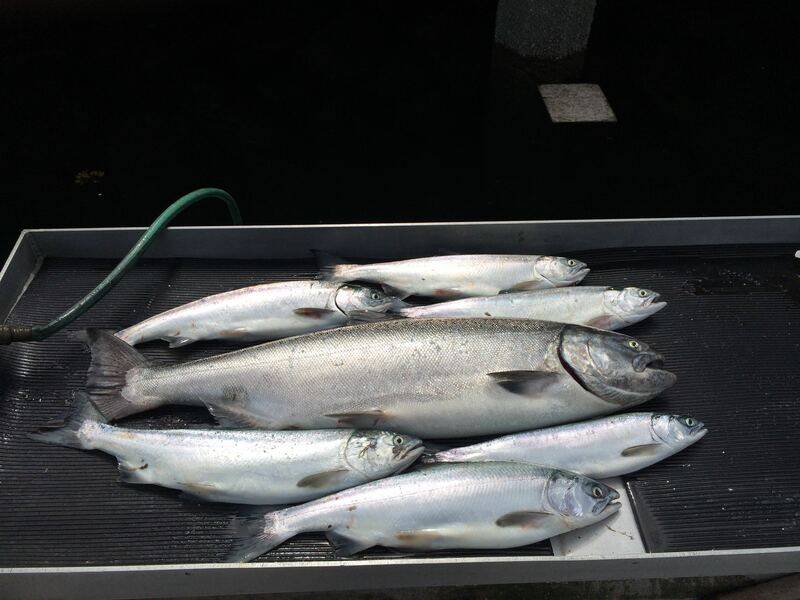 The 4th Annual Vancouver Chinook Classic Catch and Release Derby is fast approaching. 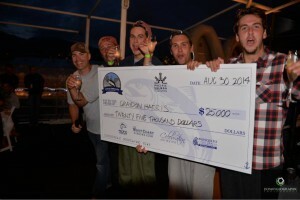 Join us this year for your chance to win over $50,000 in cash and prizes. The Vancouver Chinook Classic is the premier catch and release salmon fishing event hosted annually in Vancouver. With a new location, based out of the new marina at the amazing Pacific Gateway Hotel in Richmond derby entrants will be much closer to the mouth of the Fraser and be able to enjoy the amenities of the hotel throughout the tournament. Held one week earlier to maximize on this years big chinook return, this 2-day event awards the largest cash prize of any fishing derby in Vancouver. Not only do you have the chance to win amazing prizes, the tournament is also an opportunity to support local charities and salmon stewards. The Vancouver Chinook Classic raises awareness and funds for Capilano Little Ones School and the Pacific Salmon Foundation. Last year’s tournament raised $10,000 for the Pacific Salmon Foundation! Your tournament entry includes moorage, registration gift bag, hot fisherman’s breakfast both days, gourmet dinner including 2 drink tickets on night one, entertainment, awards ceremony and barbeque with 2 drink tickets on day two, and special daily prizes from our sponsors. For more details and to register visit the Vancouver Chinook Classic Website! Effective 00:01 hours, Saturday, August 1 until 23:59 hours Thursday, December 31, 2015, the daily limit for chinook is two with a minimum size of 62 cm. Effective 00:01 hours, Saturday, August 1 until 23:59 hours Monday, August 31, 2015 the daily limit for chinook salmon is four with only one greater than 50cm. Effective 00:01 hours, Saturday, August 1 until 23:59 hours Thursday, December 31, 2015 the daily limit for pink salmon is four. Effective 00:01 hours, Saturday, August 1 until 23:59 hours Thursday, December 31, 2015 the daily limit for chum salmon is four. There is no retention of sockeye salmon permitted at this time. Given the low abundance of sockeye and the expected en-route mortality impacts on sockeye are to be minimized and DFO is working with all users of the resource to limit impacts on sockeye. While fishing for pink, chinook and chum salmon, anglers should avoid using fishing methods that catch sockeye salmon and fish selectively. The first principle of selective harvesting is to avoid catching non-targeted stocks. This means that anglers should use methods that do not catch sockeye. We encourage anglers to continue to use these methods to target pink, chinook and chum while avoiding sockeye. Please note that bottom bouncing is NOT considered a selective fishing method and is strongly discouraged. The Department requests that selective fishing techniques be used and will continue to closely monitor the situation to ensure impacts on sockeye are at a minimum. Should DFO feel that the rate of compliance is insufficient to ensure the adequate passage of sockeye, spot closures or a “no fishing for salmon” restriction may result. The Department will continue to review stock status and environmental information on a regular basis to help inform future fisheries management decisions and fishing opportunities. Updated information will be announced by fishery notice. 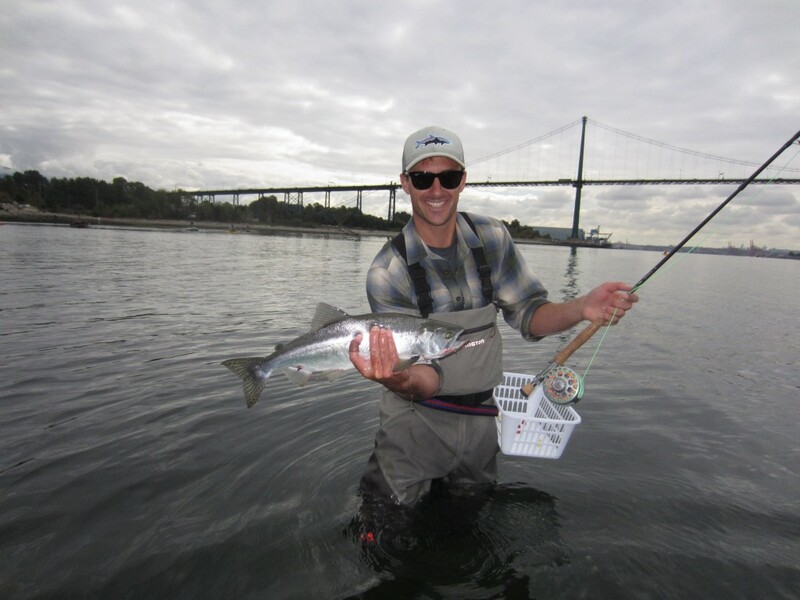 Barbless hooks are required when fishing for salmon in tidal waters of British Columbia. The term “marked” means a hatchery fish that has a healed scar in place of the adipose fin. Sport anglers are encouraged to participate in the Salmon Sport Head Recovery program by labeling and submitting heads from adipose fin-clipped chinook and coho salmon. Recovery of coded-wire tags provides critical information for coast-wide stock assessment. Contact the Salmon Sport Head Recovery Program toll free at (866) 483-9994 for further information. Anglers are advised to check http://bcsportfishguide.ca for fishing closures and other recreational fishing information. Did you witness suspicious fishing activity or a violation? If so, please call the Fisheries and Ocean Canada 24-hour toll free Observe, Record, Report line at (800) 465-4336. For the 24-hour recorded opening and closure line, call toll free at 1 (866)431-FISH(3474).